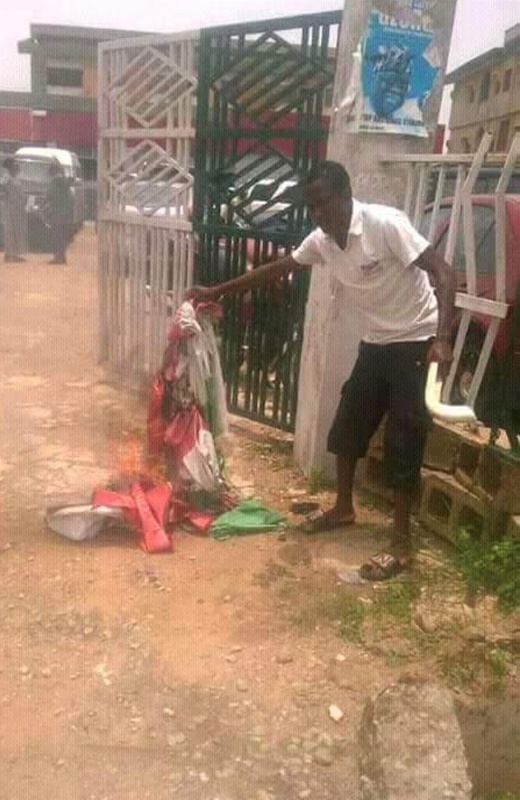 omisore supporters burn pdp flags. The crisis rocking the Osun State chapter of the PDP has worsened as a leader of the party in the state, Iyiola Omisore allegedly ordered the burning of some party flags. The action might have signaled the departure of Omisore from the PDP. Former Special Adviser to Governor Olagunsoye Oyinlola on Students Affairs, Adeniyi Bamidele popularly known as Sangaruwa led those who burned the flag. Adeniyi and five others are among those who are currently challenging the last month congress that produced Soji Adagunodo as Chairman of the party in the state . The matter is before an Abuja High Court. Omisore and his supporters boycotted the congresses where the State Working Committee and executives of PDP at the ward and local government levels were elected. Last week, Omisore who contested against Governor Rauf Aregbesola in the 2014 governorship poll had given indications that he could leave the party to contest the governorship election again. The new party that Omisore will join to pursue his governorship ambition in the September 22nd gubernatorial election in the state was not known but it was confirmed that he was no more in PDP. After the burning of the PDP flags hoisted at his house located at Ogo-Oluwa area which was the former Secretariat of the party, Omisore held a meeting with his supporters who were eager to know the new party he would take them to. Some of the PDP chieftains sighted at the meeting include the former Minister of Police Affairs, Jelili Adesiyan and former Commissioner for Works in the state, Bayo Faforiji. The Chairman of PDP in the state, Adagunodo described the action of Omisore as hasty and needless. He described the burning of the PDP flags by Omisore and his supporters as unfortunate.